2nd Wisconsin: Mustered in June 11, 1861. It had a total of 1048 men in 10 companies, including a 34 musician band. This regiment was sent east early enough to take part in the first battle of Bull Run near Manassas Junction. 6th Wisconsin: Mustered in on July 16, 1861. A total of 1084 men formed 10 companies, including 34 musicians for the band. 7th Wisconsin: Mustered in on Sept 21, 1861. A total of 1106 men, again including 34 musicians, formed 10 companies and the band. 19th Indiana: Mustered in on July 29, 1861. It consisted of 10 companies and a band for a total of 1046 men. Battery B, 4th US Artillery was closely related to the Iron Brigade. General John Gibbon (the second commander of the brigade) once commanded this battery for the regular army. When the battery was low on men Gibbon allowed men from the Iron Brigade to man the guns. The battery was originally formed in March 1821 and had six 12lb Napoleon smoothbore guns. Although some authors don't consider the battery as strictly a member of the Brigade, it's performance firing by the side of this brigade and manned by many western volunteers, earn it recognition, gratitude, and a place on the list. 24th Michigan: Mustered in on August 15, 1862, this regiment joined the Iron Brigade on October 9th, 1862 with 838 men including the band. In August 1862 the bands from the Wisconsin regiments were abolished. The 24th held on to its band until 1864. 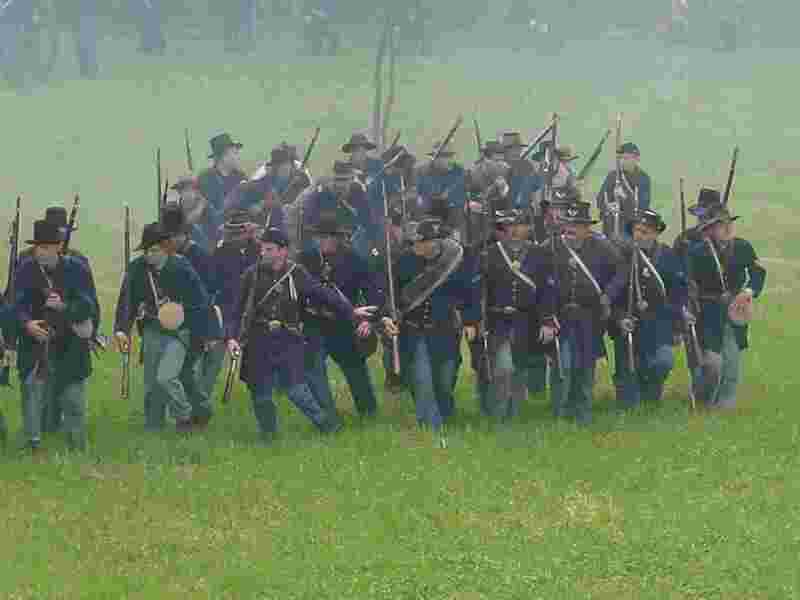 Before the 2nd Manassas the Brigade had 2100 men and officers present for the battle of Brawner Farm. For the battle of Manassas it had only 1250 men left. The brigade was built back up to a total of 1883 men before Gettysburg. In that battle a total of 1212 had become casualties. Some Black Hat re-enactors advance under fire.